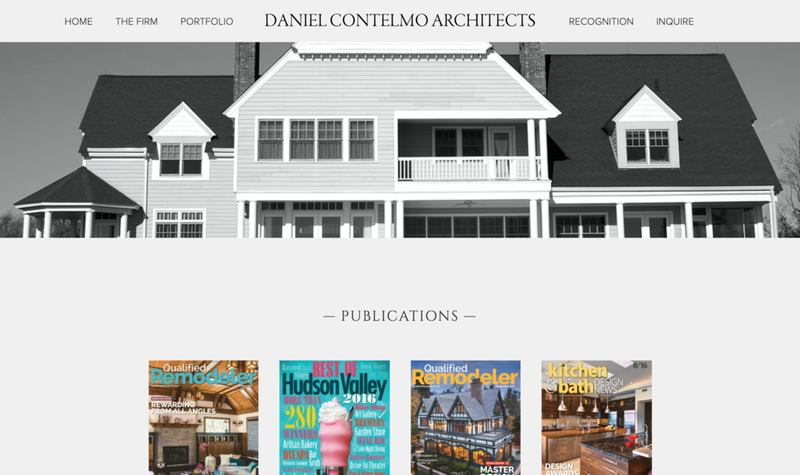 Daniel Contelmo Architects, a premier architectural firm in the Hudson Valley region of NY, realized their website was in need of an update towards the end of 2016. The firm had completed many amazing projects since their last site was launched, most of which had not been added to the website along the way. The site wasn't built on a platform that allowed Dan Contelmo's in-house staff to make updates which resulted in a website that really didn't paint a current picture of the firm overall. In fact, everything was in need of updating including projects, photography, profile and philosophy text, and office photos. Dan Contelmo and his talented team hoped to approach the website design process in much the same way they do their architecture; with an incredible respect for fine details and intuitive functionality. They turned to HALSTEAD to deliver a new website that would truly capture the essence of their award-winning firm while communicating the firm's incredible respect of architecture. Related: Fairfield House & Garden's New Website. HALSTEAD began work on the design for a new website that would, first and foremost, display the firm's work in an impactful way. Deploying careful respect to the stunning architectural photography, HALSTEAD developed a website that simply got out of the way and functioned to capture the essence of the firm's style and philosophy. Featuring large, full-bleed images with crisp resolution, soft ease-in-and-out rollover effects, and typography that echoes the firm's traditional architectural work, the new website is ready to serve as today's essential marketing centerpiece. The firm's other efforts on Houzz, Facebook, Pinterest, and ongoing awards and publication features are now all working nicely to bring potential clients back to a site that truly represents Daniel Contelmo Architects.